Living Faith Church | The Old Adam Lives! From the good folks at Living Faith Church, Cape Coral, FL and Pastor Patrick Thurmer. Lutherans know that God comes down the ladder. We are not able to climb up any ladder of righteousness or spirituality or piety or goodness to reach God and attain some status of holiness or purity. We are not able to climb up some ladder to achieve happiness, fulfillment, contentment. Though we constantly struggle to get up the ladder, to get above others, the ladders we climb just lead us further and further from God and true community. Rather, God comes down the ladder to us, blesses us, graces us, loves us. What did I do to deserve this? Nothing. That’s just the nature of God. Lutherans know that God dwells where we least expect God to dwell. We know that God is most clearly seen in odd, out-of-the-way places such as the suffering on the cross, or the shame of the animal stable, or among the outcasts. Or with people who can’t climb a ladder to save themselves. When we humans draw lines dividing us from them, good from bad, righteous from unrighteous, God is on the other side of the line. And the Cross forces us to the other side of the line, the other side of the train tracks, the other side of life, to look at and experience God’s presence amidst suffering and brokenness. 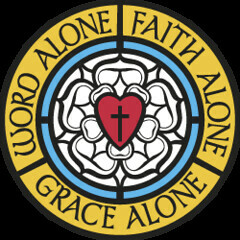 For Lutherans– Is there anything that you think ought be added, or taken out? For Non-Lutherans– Is there anything that needs further clarification, or that you think is theologically unfounded?